Nico made it back to school for one day before the forecast called for more snow and the Mayor closed the schools again. Last weekend, Nico had a fever and couldn’t play in the snow. This time he’s ready with snow pants and boots waiting by the door. While the rain intermittently turns to slushy snow and then back to rain again, my thoughts turn to dinner. But then, my thoughts are always on dinner. Just so you know we’re not starving during the great Roman freeze of 2012. 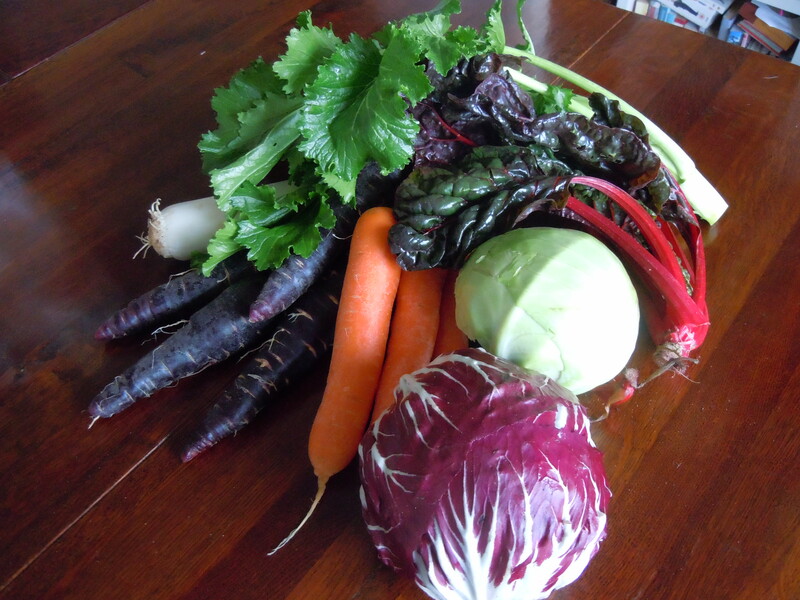 I bought all these lovely vegetables and more at Spazio Bio this morning before the weather turned horrible. In fact, things are looking good for the next few days. The courier made it through the sleet with the second season of Downton Abbey, I found a recipe for caramelized radicchio and onion tart and I even made it to the enoteca for a decent bottle of wine (Teroldego). 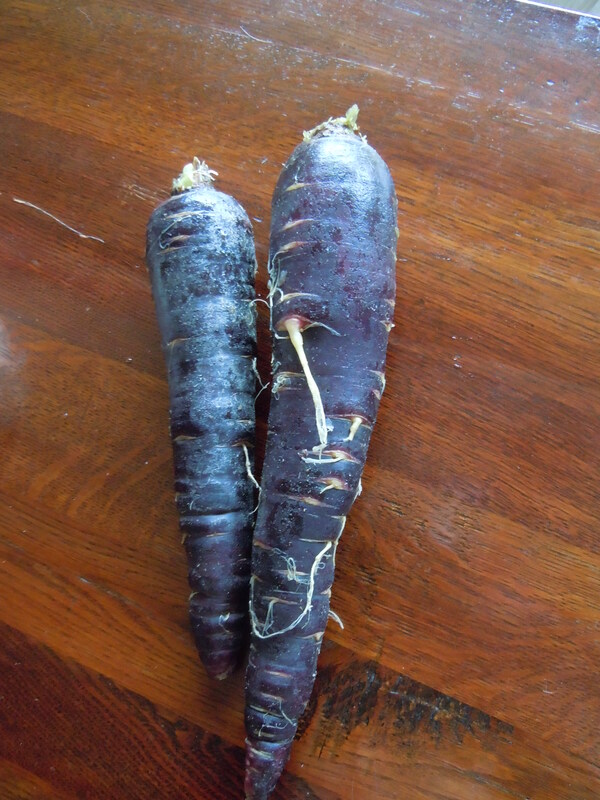 And yes – these are red carrots! Beautiful vegetables, and I’d have to say that they look a lot better than most of the produce we get at this time of year. We’ve learned to stick with what’s in season, because the out-of-season fruits and vegetables that come from places like southern Spain or northern Africa generally aren’t very good. Speaking of weather, our latest forecast is showing no more snow for our area of southwest France, and we made a drive today of about 40 kilometres without too much trouble. Just need to keep an eye peeled for sudden patches of ice. Hi Loren – Isn’t it amazing that all these vegetables are grown in Rome. They all come from a farm near the Fiumicino airport. It’s not hard to stick to local food in a place like this.